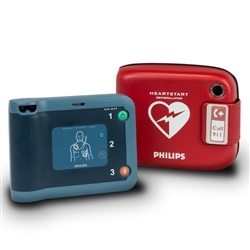 The HeartStartFRx AED from Phillips is a state of the art defibrillator that comes with an 8-year manufacturer’s warranty. 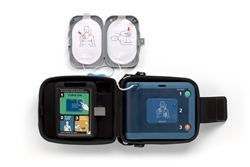 This unique model is the only one on the market with an optional infant/child key, which you can use with adult pads for pediatric patients. 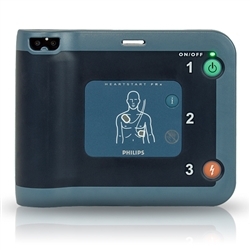 This model is both lightweight and rugged, designed to be durable without slowing you down. .
We offer the Philips Frx AED with a free carrying case, one set of SMART Pads II, a Lithium Battery pack that also comes with a 4-year warranty and a Heart Smart CPR/AED Rescue Kit (HSRK-10). The units we offer come with lifetime tracking and notification technology. First responders will be happy to discover the lighted display and interactive user face designed to provide easy-to-follow instructions, every step of the way.